The term ‘Penn East Federal Credit Union’ or ‘Penn East FCU’ or ‘PEFCU’ or ‘us’ or ‘we’ refers to the owner of the website whose registered office is 441 N. 7th Avenue, Scranton PA 18503. The term ‘you’ refers to the user or viewer of our website. Penn East Federal Credit Union reserves the right to change the terms, conditions, and notices under which the Penn East FCU Website and Online Secured Services are offered. You are responsible for regularly reviewing these terms and conditions and additional terms. Your continued use of the Penn East Federal Credit Union Website and Online Services constitutes your agreement to all such terms, conditions, and notices. In no event shall Penn East Federal Credit Union be liable for any lost data, use, profits, savings, goodwill, or indirect, incidental, special, consequential, exemplary or punitive damages arising out of or relating to your use or your inability to use information contained in this website. Your sole remedy for any damages related to the use of this website or information downloaded from this website is to discontinue use of this website. The content of the pages of this website is for your general information and use only. Content is subject to change without notice and is made as timely as possible. You acknowledge that such information and materials available through this site are provided “AS IS” and with all faults. Content may include technical inaccuracies, typographical errors, and out-of-date information. You agree that this site and the information and materials available through this site are for informational purposes only and do not constitute an offer to sell or a solicitation to buy any security, even if a specific security is referenced in this site or in any website linked to this site. The use of any and all materials contained in this website is at your own risk. Unless otherwise indicated in this site, the pages, screens, text, logos, images, graphics, sound, information and materials available through this site (“the information and materials available through this site”) are the property of Penn East Federal Credit Union, its affiliates or their respective licensors and are protected by applicable copyright, patent, trademark or other intellectual property laws. You may not copy, display, distribute, download, license, modify, publish, broadcast, repost, reproduce, reuse, sell, transmit, modify, use to create a derivative work, or use for any public or commercial purpose any of the information and materials available through this site without the express written permission of Penn East Federal Credit Union. This includes through e-mail or other electronic means. You may, however, download the information and materials available through this site to a computer or print out a hard copy for your personal reference if you do not remove any copyright or other notices contained therein. Also, we encourage you to tell others how to access the information and materials directly through this site. You should send requests for our express written permission to any exception to this rule to membercare@pefcu.coop. Such sites are not under the control of Penn East Federal Credit Union, and Penn East Federal Credit Union is not responsible for their content. Penn East Federal Credit Union provides these links to you only as a convenience, and has not tested any software or verified any information found at such sites. The inclusion of any hyperlink does not imply Penn East Federal Credit Unions’ endorsement of the site or its contents. You acknowledge and understand that there are inherent risks in the use of any software or information found on the Internet. It is possible to contract a computer virus or other malicious code by using the Internet or materials downloaded from it. Penn East Federal Credit Union does not guaranty that this site or any of the information and materials available through this site will be virus or problem free, and we disclaim liability (if any) for viruses and similar problems. We attempt to keep our site virus free, but cannot assure you that our efforts will be successful. Messages transmitted via regular electronic mail (e-mail) are not secure and any information transmitted to this site via e-mail will not be treated as confidential. Penn East Federal Credit Union may use e-mail or other forms of input provided by visitors to this site for any purpose without compensation to the contributor. We strongly suggest that you do not provide personal or account information via regular electronic mail (e-mail) or make a request that sensitive and confidential information be emailed to you. Penn East Federal Credit Union reserves the right, at its sole discretion, to revoke any or all access and use authorizations granted to site visitors at any time, without notice. Penn East Federal Credit Union may also terminate or suspend your access to Penn East Federal Credit Union Online Secured Services for inactivity, which is defined as failing to log into a particular service for an extended period of time, as determined Penn East Federal Credit Union. Upon termination of the Penn East Federal Credit Union Online Secured Services, your right to use these services immediately ceases. If you have questions or comments about this policy, please contact membercare@penneastfcu.coop. 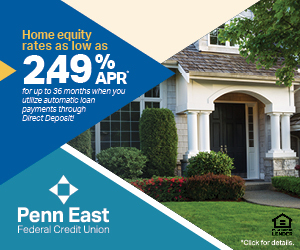 Penn East Federal Credit Union is an online financial service provider that facilitates certain credit decisions for members based on their past credit history and current financial performance. We understand that you expect privacy, confidentiality and security for your financial transactions. We collect and use information about you only when we reasonably expect it is necessary to complete and process your loan application. We ask for information such as contact information (like name, address, phone number, etc. ), unique identifiers (like social security number and date of birth) and financial information (like income amount) for specific business purposes in evaluating your loan request. We request and use information obtained from national consumer credit reporting companies to further evaluate your loan application. At this time, we use information obtained from Equifax, TransUnion and Experian. We provide training to our employees, which stress the importance of maintaining confidentiality of accounts. We maintain certain security standards to deter unauthorized access to confidential information about you. The integrity of our information is tested on a routine basis to validate and improve the protection we offer. At times, it may be necessary that we share information about you with a party outside the Penn East Federal Credit Union or affiliated entities, such as a vendor that we hire for support services. These vendors agree to safeguard any confidential information obtained and must abide by applicable law. You ask that we provide information or authorize its release. The information is necessary so we may complete a transaction you initiated. The disclosure is required or permitted by law. The information is provided to an established national credit-reporting agency. Consent, for yourself and in respect of your property, to the exclusive jurisdiction of these courts. Waive any immunity or objection, including any objection to personal jurisdiction or the laying of venue or based on the grounds of forum non conveniens, which you may have from or to the bringing of the dispute in such jurisdiction. Waive any personal service of any summons, complaint or other process that may be made by any other means permitted by the State of Pennsylvania. Waive any right to trial by jury. Agree that any such dispute shall be decided by court trial without a jury. If you do not want to be bound by any changes, you must not use this site or any of the information and materials available through this site after the changes become effective.